One of the bureacratic bundles of red tape are the number of forms issued to WINZ applicants. 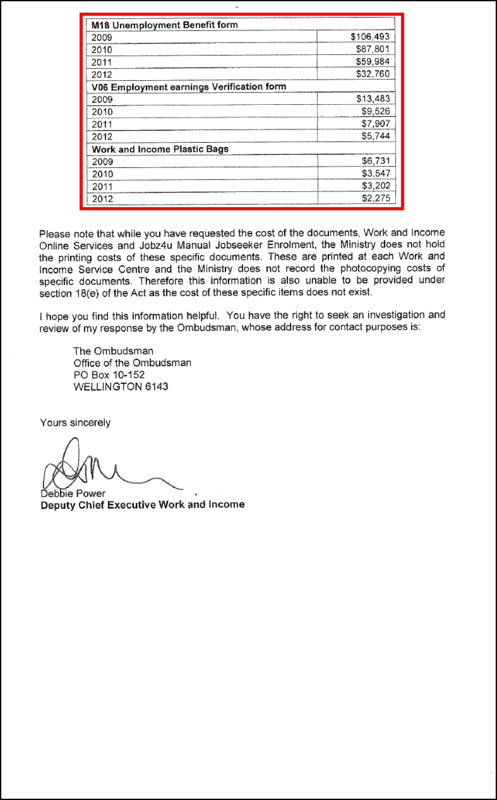 For those readers who have never had the “delight” of dealing with WINZ – these are the forms that are required to be filled out. Note: every single applicant is given these forms (in a little plastic carry-bag). And if you have to reapply to WINZ for a benefit (if, say, you’ve lost your job again) you are required to fill out these forms all over again. This is where taxpayer’s money is really going to waste in welfare. This system becomes even more laughable when one considers that if an an applicant has been a WINZ “client” (ie, beneficiary) before, they remain on MSD’s computer files. Much of the information sought is already on-file. “Social Development Minister Paula Bennett this morning said latest figures showed 328,043 people were now on benefits, with 57,058 of those on an unemployment benefit. Reforms passed by Parliament require people on an unemployment benefit to reapply for it after one year. Bennett said this change had led to 5000 people cancelling their benefit. How many people with minimal education or poor command of the English language could hope to fill out so many forms of such complexity? By contrast, applying for a bank mortage is vastly simpler – an irony considering the vastly greater sums of money involved. Eight pages for a mortgage to borrow anywhere from $250,000 to $1 million and upward. So how much does all this cost us? I would like to make an official Freedom of Information Request. “Work and Income” plastic carrybag for above items. Please provide total costings for EACH item printed, on an annual basis for the last four years, and a break-down of costings for usage per year and per WINZ client. Firstly, it’s disappointing to note that of the eight items that I requested costings for, MSD could provide figures for only five. 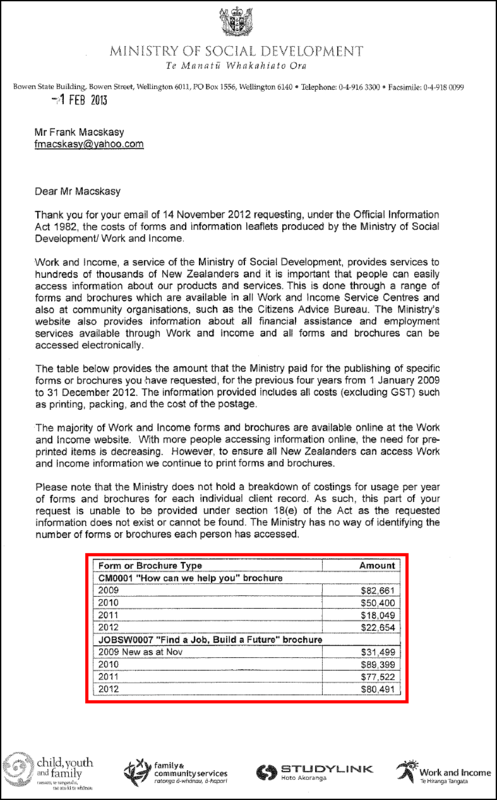 They admitted not have costings for two documents (“Jobz4u Manual Jobseeker Enrolment” and “Work and Income Online Services” ) and made no mention of another (“Work and Income Unemployment Benefit Application – What to bring” ). However, based on figures provided for other documents, we can certainly make some rough guesses. If MSD’s figures are correct, over four years, the cost of printing these 72 pages is around $1 million. Not a hell of a lot, when considering that WINZ benefit’s will be approximate $4.9 billion for just this financial year alone (see: Budget 2012 – Vote Social Development). But if a Bank can offer mortgages from $1 to millions of dollars, using an eight page application form – then why would a government department be wasting hundreds of thousands of dollars – millions over decades – for a measely $204.96 (per week, net, for a single person over 25)? The reason is fairly obvious. A Bank welcomes a new client in the hope of offering a financial service – eg, a mortgage. Banks view clients as assets. Yet, at a time when we have a critical shortage of skilled workers in this country – especially tradespeople for the Christchurch re-build – National views those seeking welfare assistance as a liability. This is about as short-sighted as a conservative, market-oriented government can get. It shows a lot about the narrow-sightedness of National’s ministers when, like a bank, they don’t see that 170,000 unemployed is an asset waiting to be upskilled; trained and supported into new careers. Just imagine; 170,000 new builders, computer technicians, doctors, electricians, nurses, quantity-surveyors, scientists, teachers, vets, etc. Imagine the economic growth this country would have if National viewed an army of 170,000 unemployed as an asset waiting to be tapped – rather than discouraged. National evidently can’t. Not when they prefer to spend millions on 72 pages of bureacratic rubbish, which would put of a lot of people. 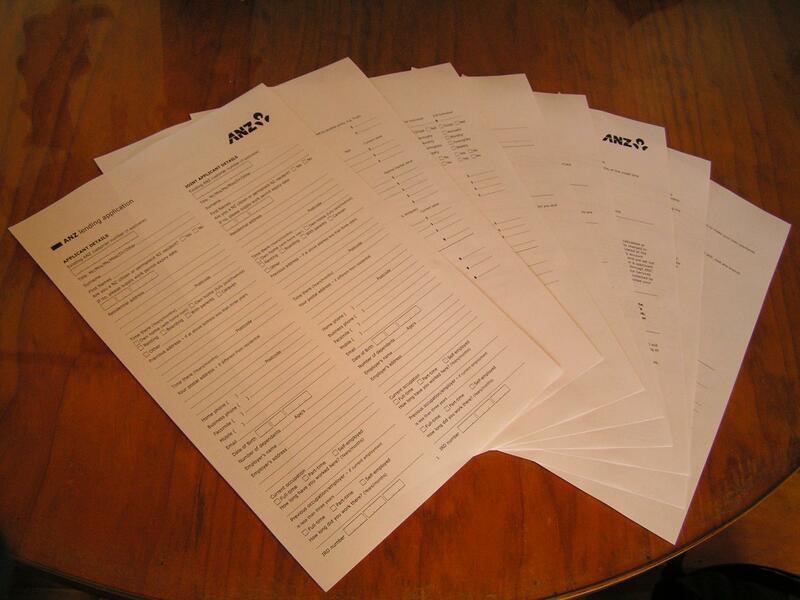 I wonder how much business a bank would get if they demanded that new clients fill out 72 pages of forms? So why does the government do it? This is the predictable consequence when a hands-off government does nothing to grow the economy and generate new jobs. This is the predictable consequence when a government treats unemployed workers as a liability to be discouraged and labelled as ‘bludgers’ – rather than recognising the asset that they really are. This is the predictable consequence of a National government. Despite recent assurances from the Prime Minister, John Key, to restrict foreign purchases of NZ farmland, his assurances that, “I think we’re making progress in this area” seems to be based on empty words and little more. As the Dominion Post reported last year, “an average of 82 hectares of agricultural land per day has been approved for sale to offshore investors”. It seems quite clear that John Key’s optimistic view that ” I think we’re making progress in this area” is wildly misplace. As usual, his soothing, reassuring words bear little relationship to reality. But voters have yet to figure that out, collectively. What the New Zealand public does understand, with crystal clarity, is that selling our farmland to overseas investors is counter-productive; counter-intuitive; and short-sighted economically. It also cheats our children of their birthright. New Zealand farmland is over-priced and farmers have gotten into trouble with massive bankloans and reducing equity. In part, this is due to the weasy credit that has been available to NZ society since 1985, when our banking system was de-regulated by you-know-who. 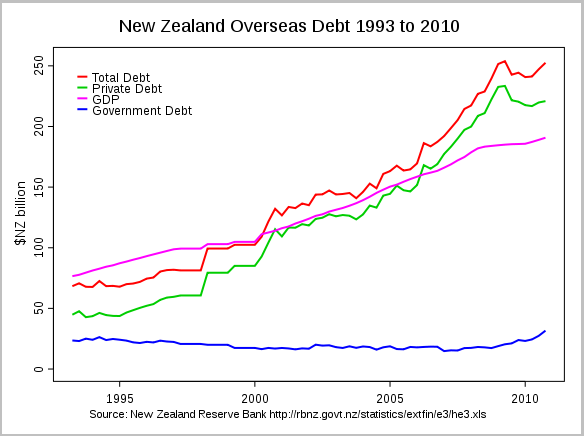 De-regulation meant that vast amounts of money flowed into NZ, for banks to lend out as mortgages, investments, loans, etc. It also meant that, as money-supply increased, so did property prices. Quite simply, we could expect to sell our properties because there was an endless supply of money available from banks. 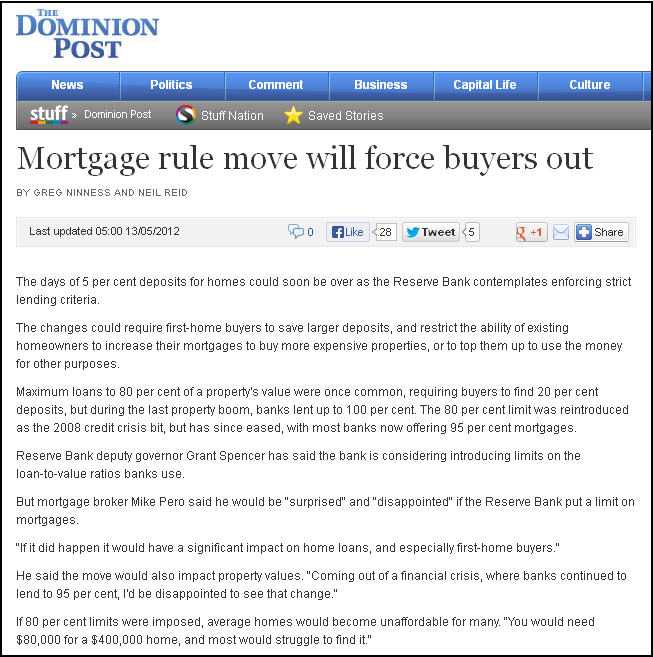 Purchasers could borrow 80%, 90%, and sometimes 100% for mortgages. So property prices went up. Our borrowings went up. Demand went up, as speculation was tax-free (remember that there is no Capital Gains Tax in NZ). It was an uncontrolled spending spree, without any consideration that eventually, the bubble would burst. Well, in 2008, the bubble burst. In early 2008, there were signs that there was a crisis looming in the US banking industry. On 3 March 2008, the Federal Deposit Insurance Corp, the US federal agency that backs bank deposits, identified 76 banks as in trouble , a 52% increase from a year ago. By July 2008, Freddie Mac and Fannie Mae, were in severe financial trouble. On 15 September 2008, Lehmann Bros, in Wall St, New York, filed for bankruptcy. The subsequent chain reaction of banking failures sparked a global financial crisis and the world fell headlong into a recession. Here in NZ, credit dried up, and suddenly our farms were no longer worth the high prices that people had been paying for them. The property boom came grinding to a halt, and the “bubble” well and truly burst. We could no longer afford to buy over-priced properties to make speculative profits that had been financed using money borrowed from overseas. It was time to pay the Piper. For many owners of farmland, the obvious solution seems to be to sell properties to overseas interests. 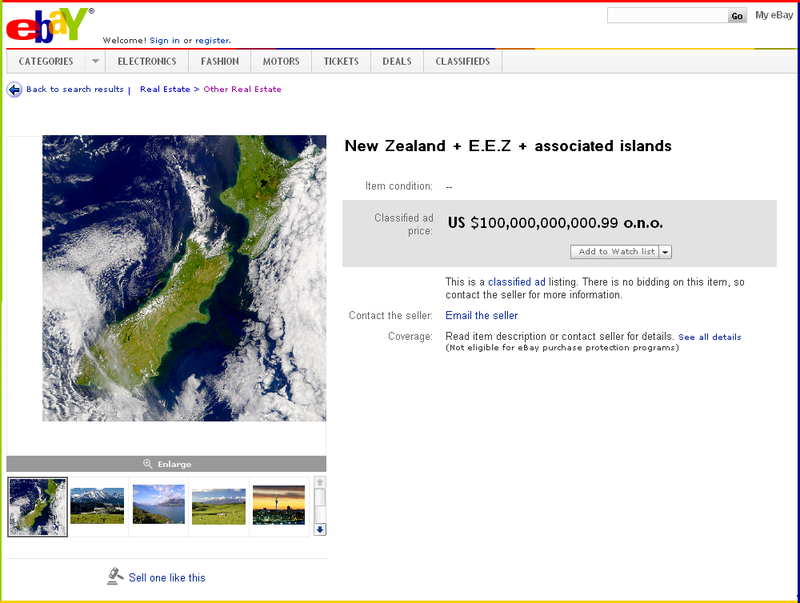 Foreigners have the necessary capital – which local New Zealanders do not. Unfortunately, in doing so, we are effectively locking-out our next generation from the opportunities that our generation – the massive-borrowing, heavily-indebted, Baby Boomers – had enjoyed. We have played “monopoly” with our farms; making ever-increasing profits; as we sold land to each other in a kingd of mad, money-go-round. Now, we can only save our indebted ‘skins’ by selling out to foreign interests. This is simply another chapter of the story I told here; “Greed is Good?“. Is it fare, I ask myself, that we have priced farm land out of reach of our children? Is it fare, I ask myself, that instead of our children enjoying the same opportunities that we did – that instead it will be Germans , Americans, Swiss, Chinese, etc, who will now reap the benefits? “A Victorian-based Kiwi with a student loan debt, who did not want to be named because he did not want to be found by the Government, said he did not intend to pay back any of his student loan. 1. Profits will flow back overseas, to offshore investors’ banks. This will impact on our Balance of Payments (negatively, I might add). This, in turn, will affect our sovereign credit rating; the interest rates we pay for money we borrow… and finally, our mortgages. 2. As farm produce fetches higher prices overseas, expect to see this reflected in the price of dairy products and meat that we purchase in our supermarkets. We have already experienced the high cos of milk and cheese, due to high prices overseas. Expect this to worsen. Property and farm owners may object. They will squeal like stuck pigs, in fact. But the sale of our land to foreigners, whether American or Chinese; Australian or German; will eventually impact impact negatively on our economy and on the prospects of our children. Enough is enough. No more pandering to the self-interest of Baby Boomers. It is time that common sense kicked in. The sell-off of our country has to stop. Otherwise, as John Key warned, we will become tenants in our own land.